As you are preparing for house guests or even just the holidays with your close family, it can be easy to overlook your stove that hasn’t been working right for awhile or those bangs and clanks your fridge makes when it turns on or off. However, if you don’t call for appliance repairs, you may regret it on Christmas Day when your oven won’t turn on or your dishwasher leaks all over the floor. Here are a few reasons you should get any issues with your appliances resolved before it’s Christmas Eve and it’s time to serve the figgy pudding. One of the favorite parts of the holidays for many people is the food; we can all think of a family recipe or part of the holiday feast that is to die for. Also, Christmas dinner is a time to build community with those you are celebrating with. If your oven, stove, microwave, or your fridge quit, think how sad you and your guests would be to spend the holidays eating cereal. For the sake of your taste buds, get your appliances fixed! The holidays is often the time when we pull out all the stops: we dress in our finest sweater or dress, get our hair done, and maybe even stop by the local nail salon. We all want to look good, not only to feel good and impress the relatives, but also to look good for all those family photos, IG posts, and Snapchats. However, if your washer or dryer decides to quit, it might be hard to wear that knockout Christmas outfit. Don’t wear last year’s worn out sweater — give your washer and dryer the TLC that they need! In some cases, the proverbial show can still go on even if your dryer or microwave breaks. 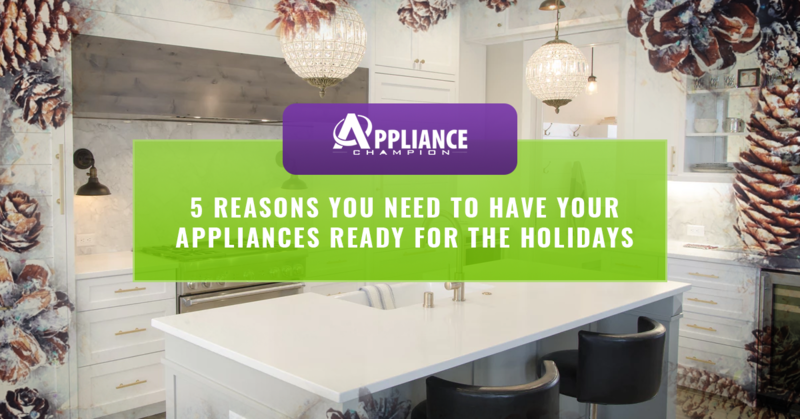 However, appliances provide convenience and help to save you time so you don’t, for example, have to spend hours hunched over the sink washing all of the holiday meal’s dirty dishes. To make sure you make time for those people and moments that matter the most, maintain your appliances so they are working for you all holiday season long. If you need appliance repair or maintenance, call Appliance Champion, Watauga’s and the Dallas-Fort Worth area’s Top Rated Local® appliance repair company! We can help your appliances keep running all season long. Call us!